Pure Dancing with the Stars » Sharna Burgess Joins “DWTS” Australia as a New Judge! 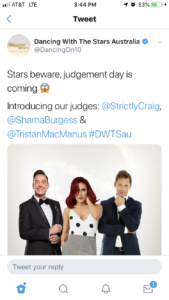 3 responses to "Sharna Burgess Joins “DWTS” Australia as a New Judge!" I love these three. So fun and refreshing!!! Heidi, I just read your note written on Feb 2nd and I just wanted to thank you for making me smile…lol…Thanks for all you do!